If you are new to Boston College or to the U.S., you might have noticed that students and classrooms here differ from your home country in some significant ways. The following section is meant to help orient you to some of the differences you might encounter in the classroom. Boston College was founded in 1863 by the Society of Jesus (the Jesuits) to educate Boston’s predominantly Irish, Catholic immigrant community. As a Jesuit, Catholic University, Boston College is rooted in a world view that calls us to learn, to search for truth, and to live in service to others. Today, Boston College has a total enrollment of around 14,000 and is ranked #32 among national universities, according to U.S. News & World Report. It is among the nation’s foremost institutions of higher learning, and a leader in the liberal arts, scientific inquiry, and student formation. Although Boston College can sometimes feel like a fairly homogeneous institution, you are likely to find students from a variety of backgrounds in your classes. Approximately 30% of the undergraduate population identifies as AHANA (African, Hispanic, Asian, and Native American) and about 7% are international. About 53% of the undergraduate population is female and only 24% of undergraduates are from Massachusetts. 38% of first-year students report a parental income greater than $200,000 a year, while 12% report a parental income of less than $50,000 a year. To find more information about BC students, please visit Facts at a Glance and the BC Factbook. And to learn more about the various programs that support our diverse student body, visit the BC Diversity page. U.S. classrooms have some distinct characteristics, compared with classrooms from other higher education systems around the world. 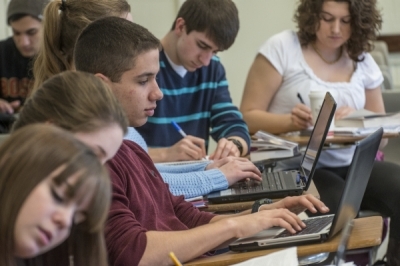 U.S. college classes are often marked by an informal atmosphere in which students ask questions and give their opinions freely and frequently. However, this informal atmosphere does not mean that course content is easy: classes are intended to be intellectually challenging, which requires students to invest effort in achieving their learning goals. U.S. college instructors, despite their academic accomplishments and busy schedules, tend to be approachable to their students. During class time, they give lectures, lead discussions, and answer students’ questions. After class, they hold office hours to talk with students and address their individual needs. Although the role of a Teaching Assistant varies across subjects and departments, some common tasks can be expected. TAs often lead lab sessions or discussions, grade exams, and address individual questions. TAs also serve as representatives of Boston College, which comes with added responsibilities in regard to institutional policies (e.g., Academic Integrity and Student Education Records). TAs are usually under the direct supervision of the professor of record for the course to which the TA is assigned. Teaching Fellows are usually graduate students who are responsible for teaching a course independently, including designing the syllabus, facilitating class sessions, and meeting with students during office hours. Compared with a TA, a TF shoulders much more responsibility with respect to both the course and the students. The department might assign a teaching mentor to answer any of the TF’s questions. It is highly recommended for TFs to meet with their teaching mentor regularly to clarify any questions about departmental and course expectations.